Now hopefully you enjoyed last article called Looking for a profitable niche , but this article will be more on the video side of things. So just to make clear, you should by now have, a profitable niche and product to promote, this next step is all about video research and video author interaction. Right, this is going to be quite a large and important tutorial, so remember, you can always go over it a few times to fully understand everything. So… if you’re a newbie marketer or a more experienced marketer your both going to be following the same steps here, we have tested all the different ways of going about these steps, and we are extremely confident in what we are about to teach you. YouTube is now the world’s second largest search engine on the web, after Google . So with statistics like these, you can see why Youtube videos are a excellent source of online traffic. And talking about traffic… that is exactly what we want! And lots of it! To start looking for videos, bring up Youtube and search for keywords related to your niche, for example, my niche is weight loss, I would look for “weight loss” “exercise routine” “appetite suppressant” “workout” etc. Pretty easy stuff! But that’s what this system is all about, Its easy! When you are searching, you want to search by most relevant first, then you want to search by the view count (remember we want high traffic videos) this can be done by the drop down menu at the top. Experiment with the different options though as well, if you search by view count with an upload date of this month you might find a video uploaded last week with 300,000 views, you never know! So be experimental with your research, delve deep and don’t settle for second best. You will thank yourself when you get your link in there. And when you find something interesting, bookmark it! That way you won’t lose it, and you can come back to it later if you would like to keep searching. The main thing that you want to look for in your videos that you are sourcing, is a high view count! More views obviously means more popularity and more traffic, and it is this prized traffic that you want to utilize! Now obviously though, we don’t just want to look for videos with high view rates, there are many other factors to consider when researching your videos . Let me ask you this… what use is 2 million views over a 4 year period? It’s not useless… but it’s not useful either, its hanging somewhere in between. Now if you had another video with the same 2 million views, but over a 2 year period, that’s 1 million views a year (not trying to insult your intelligence here ) but that is more likely to be an active and popular video, the shorter the time the video has been uploaded, the better! This is not the only factor you must consider though… You must check the comments, are they fresh? A good indicator is comments that have been left on the day, or the day before, if you find a video with comments left, a week, 2 weeks, or a month ago, try and find something better, never settle for a mediocre video! The most important thing you must check though, is the stats bar for the video, this is going to give you all of your important information for your video. You can obtain it by clicking the dropdown menu by the view count. It will tell you if your video is active! The view stats bar must be going straight up in a diagonal! The stats will also tell you, the videos audience, mainly Male or Female? And the age range of the people visiting the video, 25-34? 35-44? etc. And it will also tell you the most popular countries that visit the video. All these different aspects of information will help you to gauge if your video will be profitable within relation to your niche. We like to make sure that most people visiting the video, are from a billable country. A very handy tool to use indeed! Check their personal page to see when they “last signed in” anything longer than 6 months, don’t expect much… but still mail them. Now comes the interesting part… we have done extensive testing with this next part, and intend to show you exactly how to approach people and show you why this is an extremely important stage! There are two routes you can take, both require a message though, the first is to offer them $50 outright for the video (you will make this back) or you can offer them a commission on whatever you make (say 20 percent) so if you sell a product at $30 you will give them $6. We have had good success with both methods, at the end of the day, once they receive 1 payment off you they are under your thumb, they won’t want to lose your money, this puts you in control of how much you want to pay them, but don’t take liberties though! After all it is their video. So put yourself in the shoes of an average, non internet savvy user. Someone contacts you out of the blue asking you a bunch of requests and offering you money. What are you going to think? Now, what we noticed is, there are lots of different types of people on Youtube… Some will snap up your offer before you can say hello, and others will tell you where to go! And that’s just how it is, which is why you need to read this next bit carefully, or you are going to screw every chance you get of sealing a deal for advertising space. A fact of life on the internet is that many people are afraid of getting scammed, or ripped off, and it’s not surprising, what can you do about it when you are sitting at home in your living room? you will need to tread carefully. “HI MY NAME IS BOB, IM AN INTERNET MARKETER…” it doesn’t work, trust us! Keep it short, sweet and to the point. Give them a choice as well “if you are interested, just drop me a message back when you can” . This works on building trust. And yo u will need to do all the work. This seemed like an excellent idea (we are lazy ). But we eventually decided against it, as there was no thought put into it, it wasn’t relevant enough to the actual user (we like to add their video name and the amount of views, just to prove we have looked at it, bits like that) and had much better results writing unique messages to every user. They don’t have to be long messages, like we said before, short and sweet. Now that is all that needs to be done, it sounds genuine, and is only intended for an initial response. Once they get talking to you, you can reel them in and make a deal. But remember, just be yourself, there is no need to promote yourself in any way. It doesn’t reveal anything, and also this will likely be the case anyway, you will need a few weeks to judge how much you are making. You will be paying the author via PayPal, this is usually a fast and reliable agreement, so if you don’t have PayPal, signup for an account. Ok… I have the author on board… what do I do now? Once you have the author of the video on board and waiting, you are going to need to give them the details of your Affiliate Link, and where it should be placed… Also they will need details of what to write in the annotations box on top of their video. Nice video of James there with the Texas national guard . You can also easily “steal” all the Youtube videos you like and upload to your account. Is a kind of easy if you use this tool : Download Youtube Videos . It a safer way of doing things with your own account , but remember to change the file name before uploading it! After this you can get a bunch of 25.000 views by automation to get higher rankings on Youtube search engine. There are many providers that gives you Youtube views but i like this one More views on Youtube videos. This is important for click through rates. Something that we use quite a lot in our business is URL shorteners. Most notably www.bit.ly. You should sign up for an account here, the tool allows you turn your affiliate link into a much shorter, neater link, and it will also track how many times your link is clicked! You can see how that would be much more practical for the description box and more appealing to click on. It can dramatically improve your click through rate. So this is a must for your affiliate links. So where should we be at now? Selected a pro f i t ab l e niche. • With a relevant product. • Which is high converting. • Has a good and reliable affiliate program. • And which is feasible for the Youtube promotion system. Researched and acquired a video or videos. • With high view count. • And short upload time. • And related to your niche. You have an arrangement with the video owner. • Or by a monthly basis. 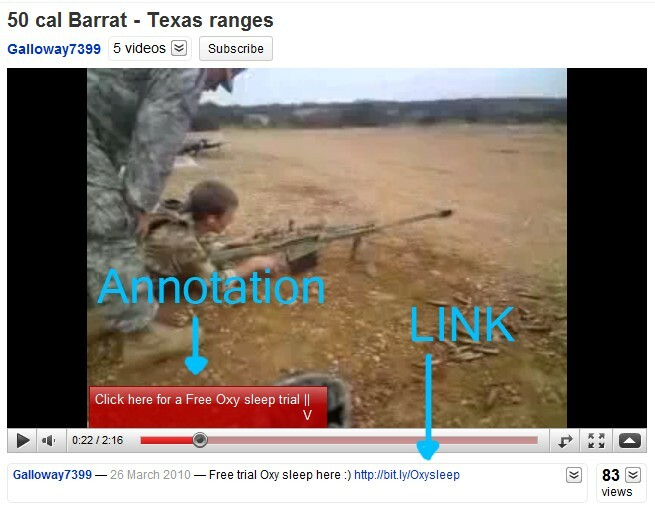 • Your annotation is related and targeted. Now all you have to do is wait, keep checking your affiliate accounts to keep track of your earnings, in some cases you may wish to add a landing page before your affiliate product page, or a review site, to help your product convert better. we have had good success with this. So guess what the next article is about… Increase your conversion rate! Stay focused on this blog for tomorrow tutorial! This entry was posted in Internet Marketing and tagged get your link, newbie marketer, product to promote, search by the view count, search for keywords, source of online traffic, video author interaction, video research. Bookmark the permalink. Follow any comments here with the RSS feed for this post. Post a comment or leave a trackback: Trackback URL.